Mardi Gras and Carnivals are held around the world just prior to the fasting season of Lent, which is coming right-up! Our regular ninth-grade English curriculum includes a pretty thorough unit on New Orleans, and thought that students in that class and those in my Intermediate English class might find it interesting to learn how it’s celebrated around the world. Readers might also want to check-out The Best Websites For Teaching & Learning About New Orleans. Fact Monster has a relatively accessible explanations of the celebration. The CBBC has a short slideshow of Carnivals throughout the world. 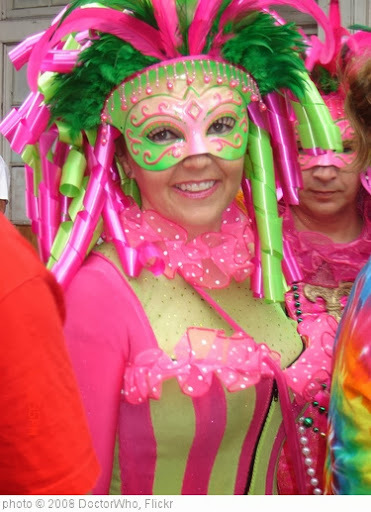 The New Orleans Times Picayune newspaper has several online slideshows about Mardis Gras. You can see a Mardi Gras video at the History Channel. The New York Times has a Mardi Gras slideshow and a video showing the first Mardi Gras celebration that took place after the devastating Hurricane Katrina. How Stuff Works has a fair amount of text about Mardi Gras. Breaking News English has a lesson, with audio support for the text, on the Brazilian Carnival. The New York Times has a slideshow about the celebration in Venice, Italy. Here are a photo gallery about various Carnival celebrations from National Geographic. A Brief History of Mardi Gras is a new slideshow from TIME Magazine. Carnival is the simple title of a collection from The Boston Globe’s Big Picture blog. It contains images from around the world. ESL Pod has a simple explanation of Mardi Gras. ESL Holiday Lessons has a simple Mardi Gras quiz. EL Civics has a Mardi Gras Lesson. Here’s a downloadable PowerPoint on Mardi Gras. The San Francisco Chronicle has a slideshow about the Slovenian Mardi Gras. The Telegraph has a slideshow about the Venice Carnival. UNESCO has a video about the carnival in Croatia. Carnival 2010 comes from The Big Picture. Rio de Janeiro carnival 2010: first night has pictures from The Telegraph. Read about Mardi Gras and answer some questions. Here are a zillion other Mardi Gras resources. Mardi Gras New Orleans Saints Style is a slideshow from TIME Magazine. A Carnival Artist Without a Carnival is a video from The New York Times about a Haitian artist. Rio fire destroys thousands of Brazil carnival costumes is from the CBBC Newsround. Carnival season kicks off in Venice, Nice and Viareggio is a slideshow from The Telegraph. Carnival 2011 is a series of photos from The Atlantic. Rio de Janeiro carnival 2011: the first night’s parades in pictures is from The Telegraph. Carnivals around the world in pictures is also from The Telegraph. Mud carnival: get down and dirty in Brazil’s earthy parade in the town of Paraty is a slideshow from The Telegraph. Carnival Returns To Haiti is a slideshow from TIME Magazine. New Orleans celebrates Mardi Gras is a slideshow from The Los Angeles Times. (I’m also adding this link to The Best Websites For Teaching & Learning About New Orleans). Carnival season: costumed revellers parade in Trinidad, Paraguay, Uruguay and Venice is a slideshow from The Telegraph. In pictures: Brazil celebrates Carnival is from The BBC. Rio Carnival 2012: costumes and celebrations is a slideshow from The Guardian. In pictures: Rio de Janeiro carnival is from The BBC. Rio de Janeiro Carnival 2012: the first night of parades in the Sambadrome is a slideshow from The Telegraph. Fat Tuesday Photos is from TIME. Carnival 2012 is a photo gallery from The Atlantic. More From Carnival 2012 is a photo gallery from The Atlantic. Carnival 2012 is a photo gallery from The Boston Globe. Mardi Gras in New Orleans is a slideshow from The Guardian. The History Channel has a good selection of multimedia resources on Mardi Gras. 2013 Rio Carnaval is a photo gallery from The Los Angeles Times. Global Carnival Celebrations is a slideshow from ABC News. In Recife, 3 Rhythms Get The Carnival Party Started is from NPR. From Brazil to Macedonia: Carnival Ignites Colorful Celebrations is a photo gallery from NBC. Carnival 2014 Around the World is a photo gallery from The Atlantic. 2014 Carnival in Rio de Janeiro is a photo gallery from The Los Angeles Times. Carnival and Mardi Gras 2014 is a photo gallery from The Boston Globe. Carnival 2015 Around the World is a photo gallery from The Atlantic. Making Mardi Gras is an Associated Press interactive. Zika virus: health experts fear Carnival celebrations will lead to spread is from The Guardian. Carnival 2016 Around the World is a series of photos from The Atlantic. Mardi Gras and Ash Wednesday 2016 is a photo gallery from The Boston Globe. Carnival 2017 Around the World is a photo gallery from The Atlantic. Photos of Carnival 2018 Around the World is from The Atlantic. Carnival in Venice 2019 is from The Atlantic. For Mardi Gras, A Parade Celebrates Mexican Immigrants In New Orleans is from NPR.